Although progress on my second Heidi dress has slowed to less than a snail’s pace, I’ve made considerable headway in the neckline refashion on my grey wool Talbot’s sheath. What can I say? It’s easy to distract me sometimes. 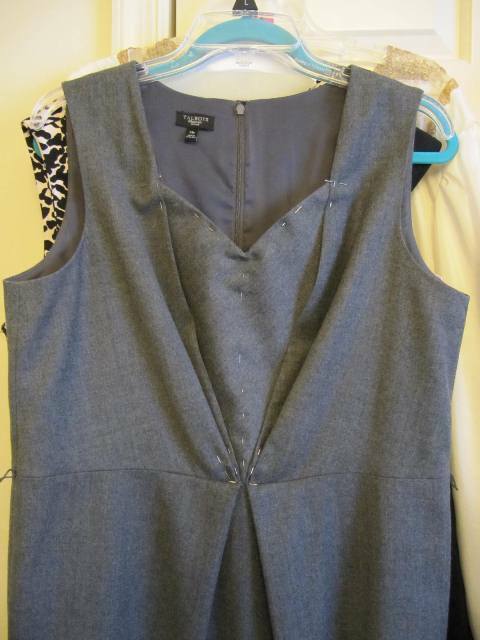 After finalizing the pattern for the refashioned bodice center panel and neckline, and cutting the existing panel accordingly—outer fabric and lining—I flipped each so that wrong sides were together, pinned them along the new neckline edge, and sewed a 3/8-inch seam. Then I pressed the seam open and understitched the lining edge to the seam allowance and pressed it all again so I could have a nice clean edge that lays perfectly flat when it’s all finished. 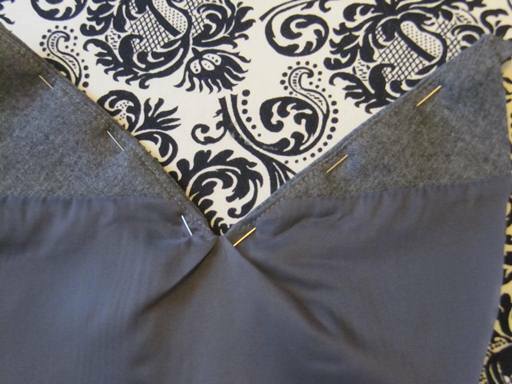 I pinned the outer panel to its lining in a straight line down the center of the panel to keep everything in place while I was working on placing it between the bodice outer fabric and lining. In retrospect, I should have basted the panel fabric and lining together to make it easier. But it worked well enough. 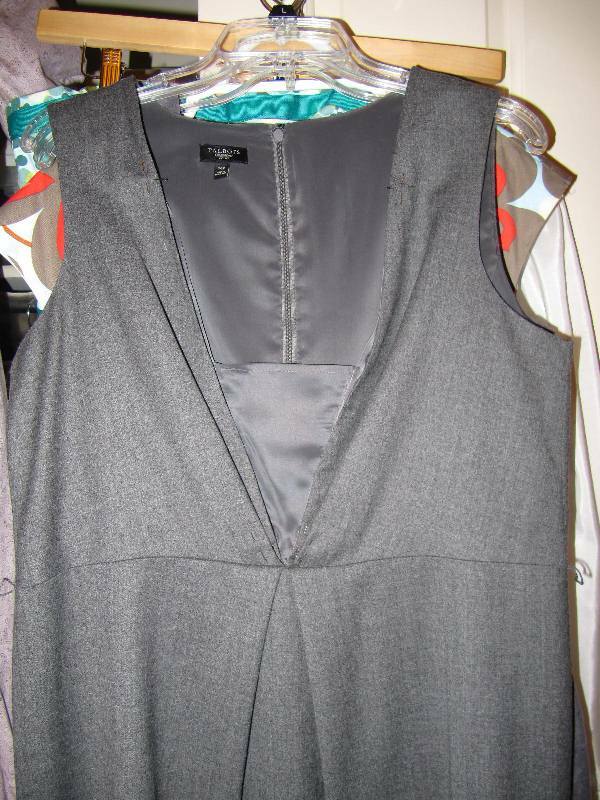 I started the placement by hanging the dress and sliding the bottom tip of the new panel between the outer dress and its lining at the open waistline seam and pinned it in place. Then I used a hand backstitch to sew it in place at the waistline. 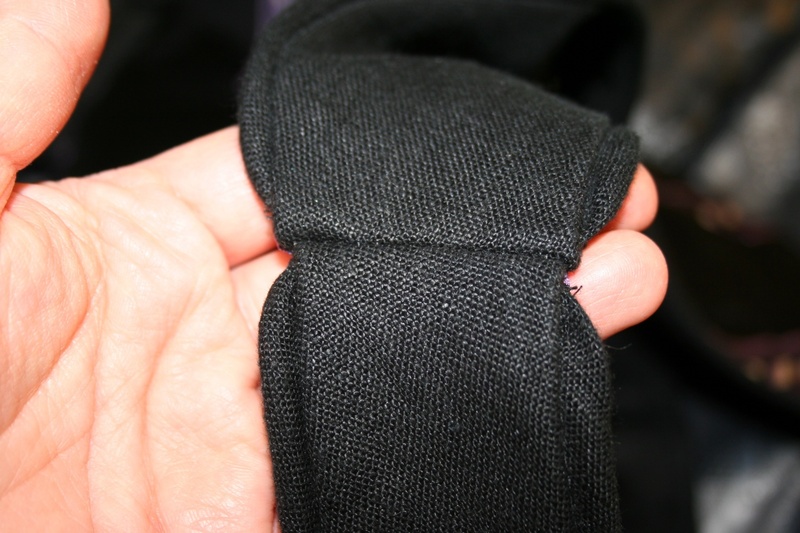 From there, it was all pinned into place along each side of the unstitched bodice center. I tried it on to make sure it was straight and even and not bunching anywhere, and amazingly it looked perfect. 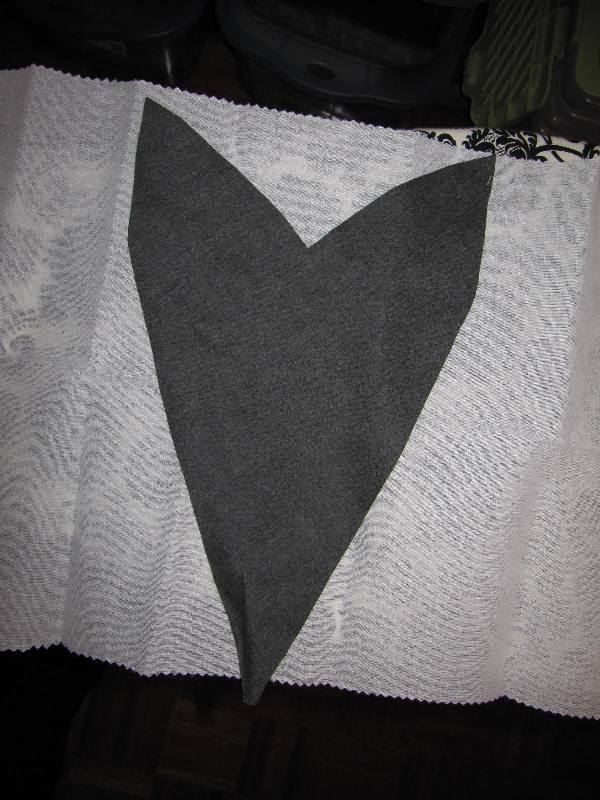 I measured the distance between the bodice edge and the center V point on each side and got 4 1/2 inches for both. I had hoped it would be easy to machine sew the panel to the bodice opening, but the existing seam allowance and the configuration and construction of the bodice (especially with the reapplied bodice stay) made it impossible. 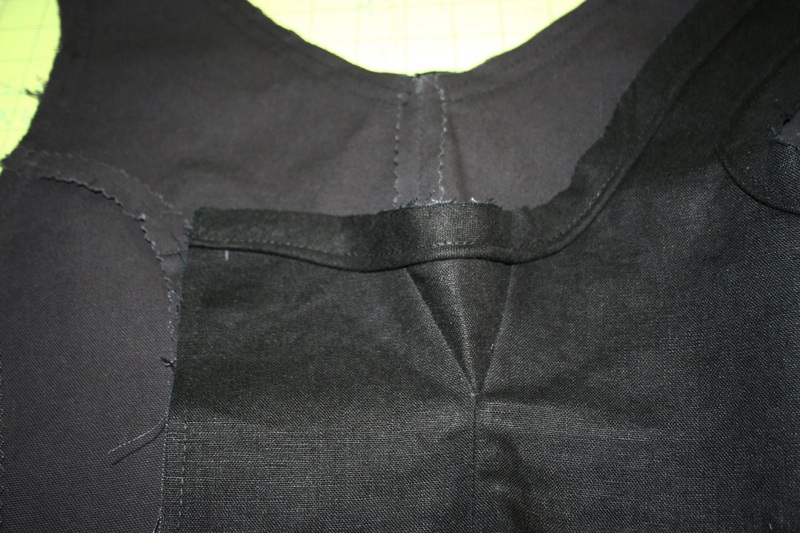 So after making sure the panel was pinned correctly in place, I simply selected a dark charcoal thread and used a tiny pickstitch to hand sew the panel in place from the outside of the bodice. If you look closely, you might be able to just make out tiny indentations where the “pick” of each stitch is located, but a good steam ironing might make them less visible. Then I flipped the skirt exterior up from its lining, pinned the open waistline seam allowance together, and machine-sewed it all together again. To reattach the bodice lining to the center panel, I’ll also use a hand pickstitch, but will probably need to apply it from the outside above the top edge of the center panel to prevent any stitches showing through. 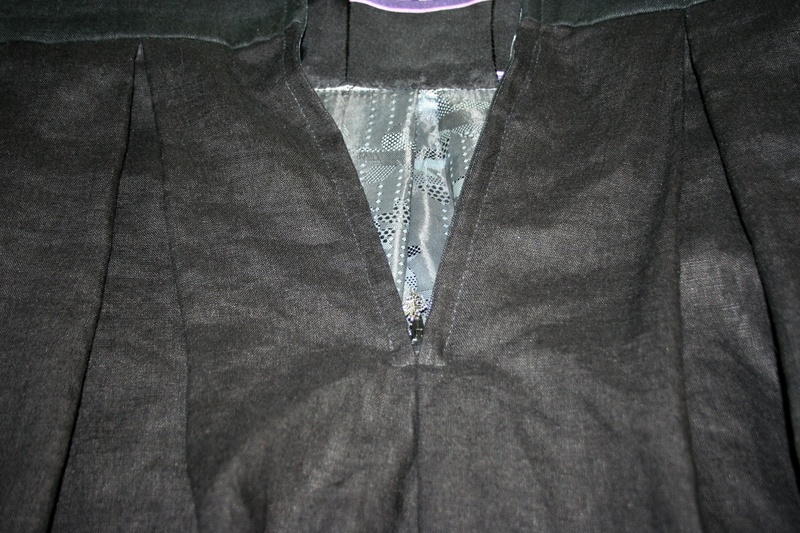 I’m not sure it’ll be necessary to stitch the lining down to the center panel below the interior bodice stay. It was all sewn down originally, of course, but first I’ll try it on to see if it’s necessary to keep things smooth (it probably will be). I’m really happy with how this refashion is turning out; it’s much better than I expected, but just as well as I had hoped. I’ve tried it on and it’s looking great. 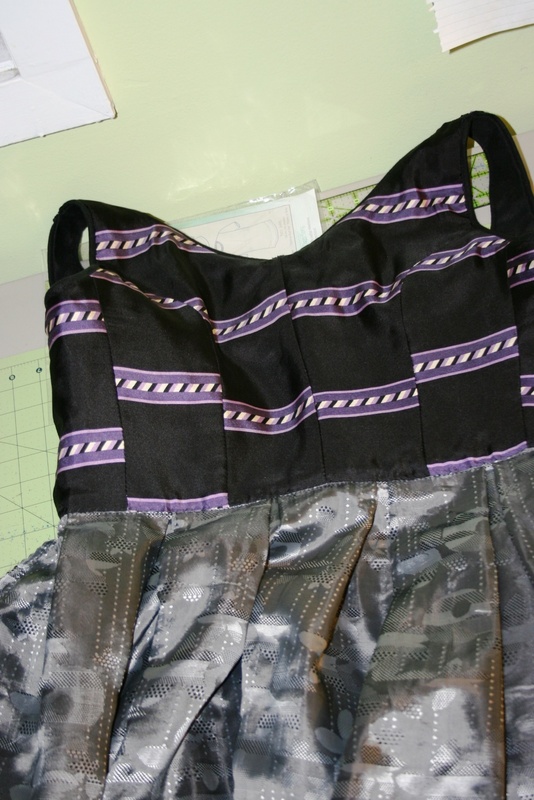 When it’s complete, I’ll post pics showing the interior lining sewn down and then the refashioned dress worn. 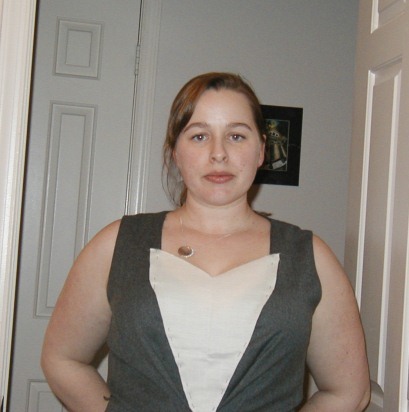 After this neckline refashion I’ll feel much more confident in taking on another one that should be simpler. I have a zebra-striped sheath from Talbots that just isn’t working for me anymore. More on that in another post. ….like I needed a hole in my head. Seriously, my stash is substantial. But there are a few patterns I really want to make and I’ve never come across the perfect material for them. So prompted by a helpful sale email from FashionFabricsClub.com, I browsed over to their selection of cotton lawns. I found three I just couldn’t do without–and I first saw one of them years ago, so I feel like I waited until it was priced just right before jumping. I purchased several yards of these three wonderful, wide-bolt cotton lawns for $4.95 per yard! They will be added to my stash, but with a purpose. 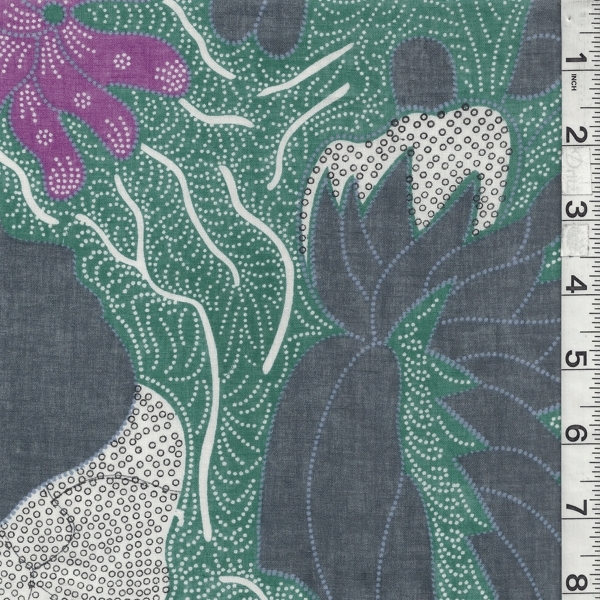 This lovely lawn in a purple, grey, and green print will be used for Vogue 8492 (now out of print), View A. I’ll probably line it in black batiste to make those colors pop! I’ve been fond of this pattern for quite some time. I love a cross-over V neckline. Jury’s out still on whether I’ll actually make the sash for either of the versions of this dress I’m planning to make, but it’s possible I will make one in purple for the above material, and possibly dark navy for the one below. 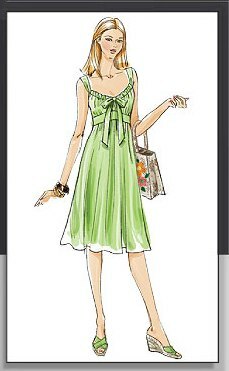 This bright-blue and white lawn (above) that just screams “SUMMER!” will also turn into the above knee-length dress. I love blue-and-white combos for summer. They remind me for some reason of depictions of vacations in Greece, where the colors are vibrant but almost hard and contrasts are stark. This’ll be lined in white batiste and probably underlined as well, for opacity. 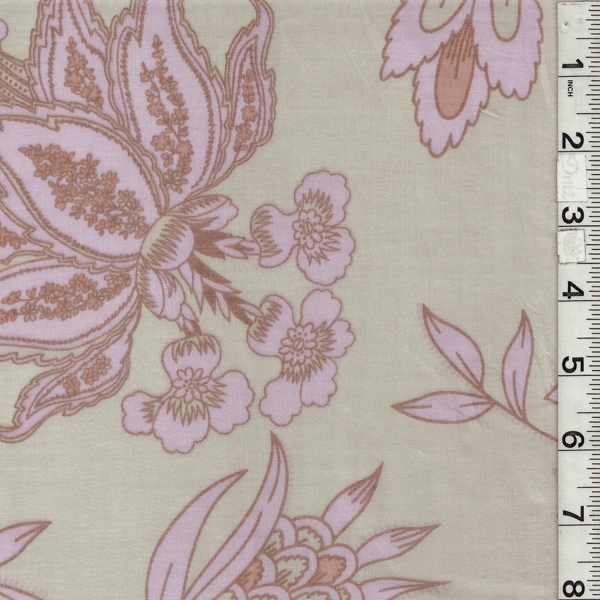 And the sweet beige-and-pink floral lawn I’ve gazed at longingly for a few years now will become Vogue 8380, the low-neck version. Just imagine this lined in pink batiste. It reminds me of candy, for some reason. I don’t usually go for such pale, sweet prints, but this reminds me very much of a frock I had a few years back with a sand background and tiny pink-and-sage flowers sprinkled all over it. It had hemline flounces and pleating through the bodice and was so wonderfully girly, which I don’t often indulge in. I’m not trying to recreate that dress, but I did love the colors and it went with so much and was perfect for the summer. 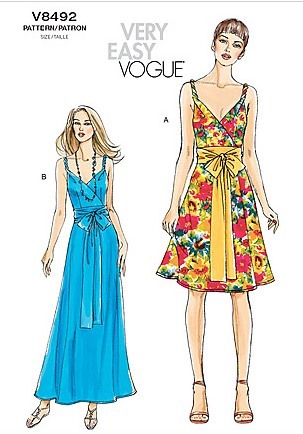 Now, I have a long list of frocks already lined up to make, so these three will go at the end of the list. But the materials are beautiful, as are the patterns, and since I don’t really pay much attention to trendy styles from season to season or year to year–at least in terms of sewing projects–I think these will keep very well. The great wool sheath from Talbots. Looks great on the model! I loved it when I tried the dress on in the shop, as well, despite the extra material making my bust look a bit—well, baggy. I plunked down my money for it and felt very satisfied with my purchase. Sometimes you just have to buck pure figure flattery for something that’s interesting. My mother was with me at the time and she loved it so much she tried one on and bought it as well. Being small-busted (way smaller than me! ), this dress works better on her. But even she now finds the drapey center panel annoying, as it won’t lay consistently unless it’s pinned. The drape panel was already unpicked here, but you can see the general effect. See how happy I look? Even with pinning, my bust looks baggy in this dress. It doesn’t lay well under cardigans or jackets, either. 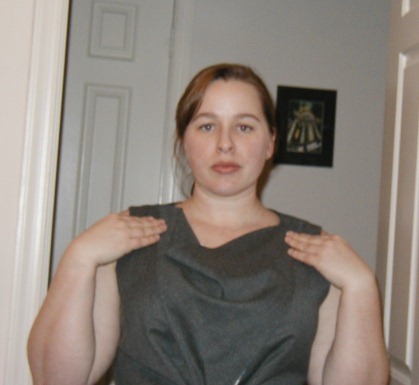 But I still love the overall effect of the dress, and have worn it many times. However, I recently came to the conclusion that I’m no longer so in love with the interesting detail that initially was so key to my purchase. So I decided to refashion the neckline. This is no easy task, and there’s a significant amount of risk in taking a RTW dress apart—even partially—and attempting such a change. But I’m willing to take it on, because otherwise, I’d get very little use out of this dress in future. I spent much of this past Saturday morning picking apart the seams where the center drape panel—a bias-cut triangle—joins the main bodice pieces. This was difficult because the bodice and skirt pleats are also made in the same general area. I had to take the dress apart at the center waist seam, as well, because the point of the fabric triangle ends within the waist seam allowance. There’s also a separate lining insert under the drapey panel that holds the main bodice pieces taut—a kind of fabric “stay”. That came out with the stitches holding the panel in place, and it was the first thing to get stitched back in place (carefully, by hand) so I could effectively play around with new bodice insert shapes. Drape panel removed, stay insert restitched in place. 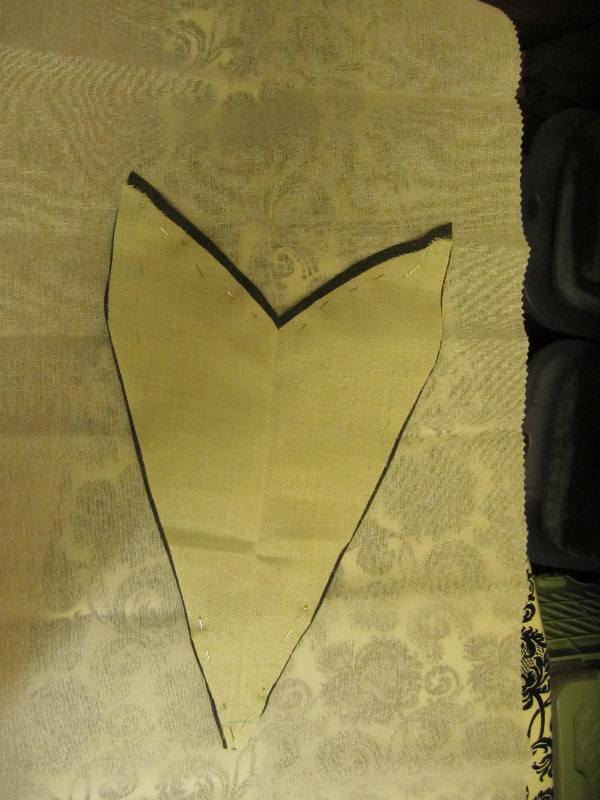 Once the disassembly and restitching of the stay-insert was done, the fun of drafting new neckline shape ideas started. 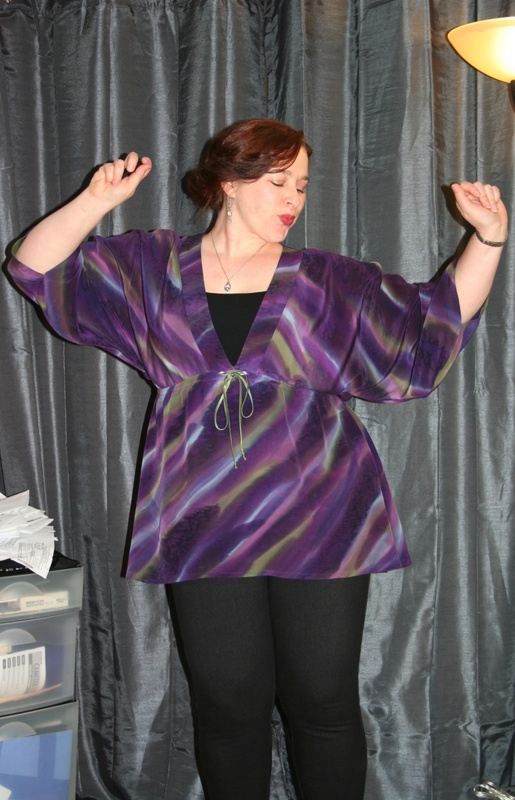 It took me a while prior to starting this project to decide on my goals for the refashion. 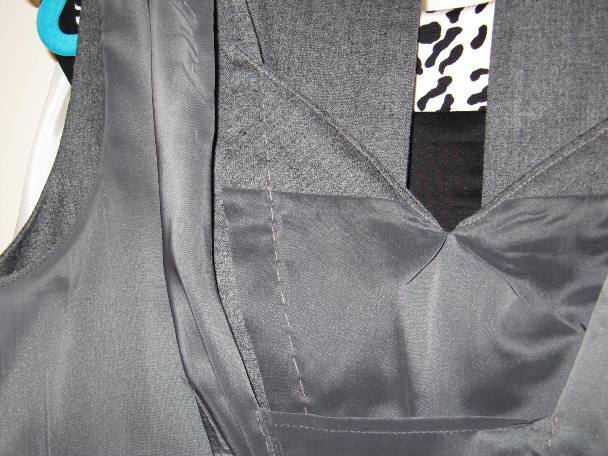 I want the new center panel to lay flat, to eliminate that extra fullness in the bust that the drape created. I also want a sharp sweetheart style neckline. I came up with a shape that’s very modern in effect, in keeping with the lines of the dress. It looks, when unfolded, like a very tall, narrow heart with sharply angled peaks, rather than softly rounded ones. 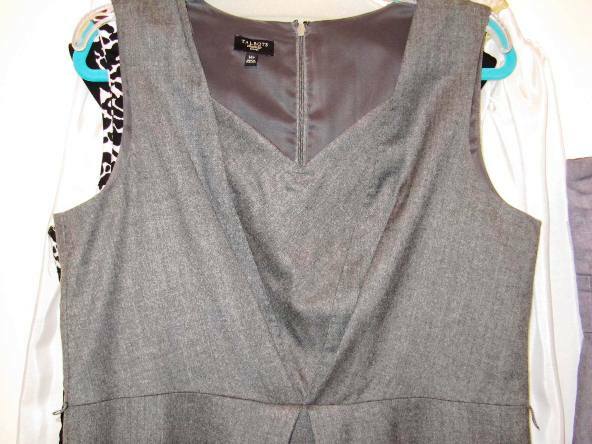 The new bodice insert is narrower than the original and has a lower neckline. The original drape was a variation on a high boat-neck. 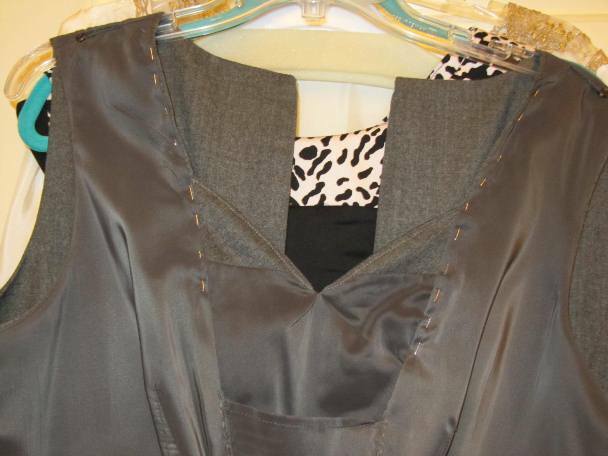 Because of the way the main bodice pieces attached to the drape panel, it will be easy to insert this new panel with the lower neckline while retaining the original seamlines. The muslin for the new bodice panel. 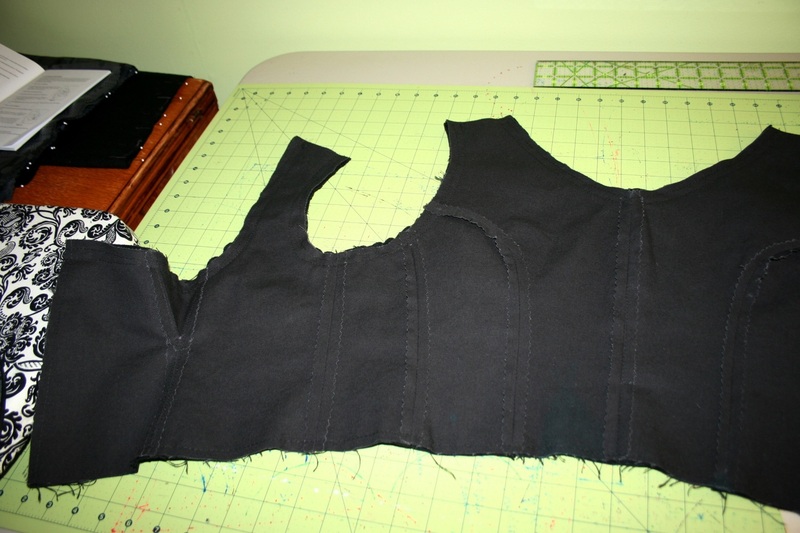 The bodice panel pinned in place. I played around with the shape a bit, putting on the dress and pinning the muslin panel in place to see how it should lay and what alterations needed to be made. Surprisingly, very little needed to be done between the first muslin cut and the recut of the original panel. The new cut wool bodice panel, freshly cut in the new shape. So now I’ve got a new center panel all ready to install in my Talbots sheath to make it even more wearable for next Fall/Winter. Still undecided as to whether I’ll attempt to machine sew the panel in place (probably not) or affix it using a hand backstitch (probably). 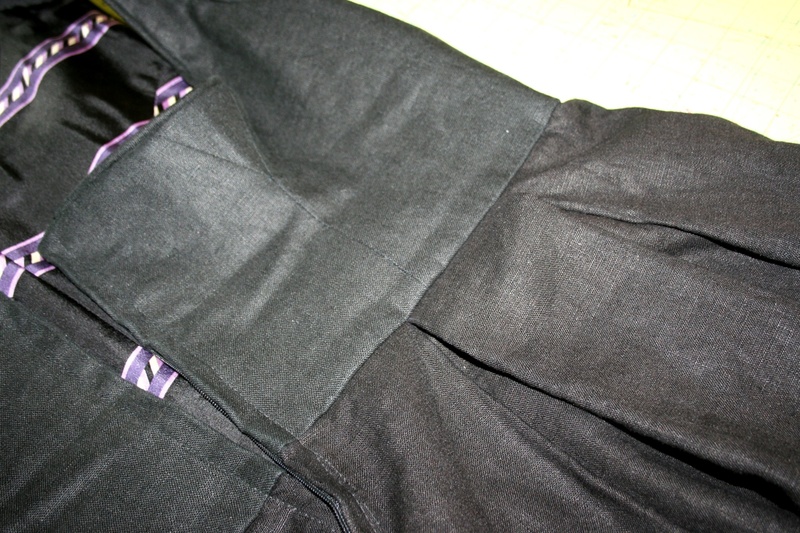 The waistline, however, will need to be machine sewn.